Delighted Hands: Which Way Did I Go? 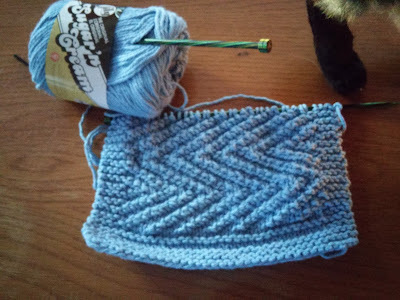 I sat down the other day and just started another dishcloth. I thought about doing stitches that would be like a Gansey sweater. and as a bonus, it is the same on each side! 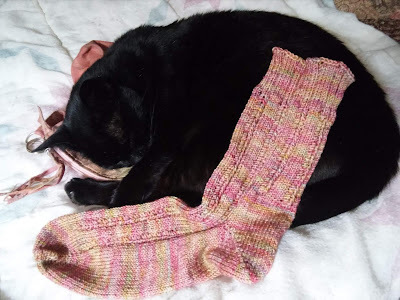 As knitters, we have fun with only a few stitches, don't we?! We sure do have fun! That turned out really nice and I love that shade of blue. Playing with sticks and string is definitely fun. Love the pattern of your cloth. Love this stitch. Very nice. Cute! I really do need to make some dishcloths. Oh my gosh I love that. Everything you touch is gorgeous. yours reminds me that I need to make new ones myself! at least that is one small project that doesn't need all that much thought and esp. no sewing together of small parts! What a pretty stitch pattern! Love that it is the same on both sides! Nice, reversible! I am going to work on some dish cloths this summer, that is my plan. Right now, I have a bunch of other things in the queue already being neglected. I'm also using dish cloths to teach knitting. It is smaller, fosters stitch familiarity and a sense of completion.